Just kicking this one off to record a few thoughts on railcars and railbuses for Neversay. The usual, warnings apply:- (1) Please don’t take my efforts too seriously. (2) I am only messing about, so if it doesn’t work I don’t mind. I can always try something else. (3) I am not deliberately trying to damage the reputation of manufacturers or the Scalefour Society in any way. (4) My reputation is not important. I don’t mind making a fool of myself. In theory, a small railcar or railbus ought to be a quick route to building a train; a vehicle that propels itself and carries passengers. Desperate for a few 'quick wins', I have been scouring books and the good old Internet for ideas. For many, a Bachmann DMU quickly fitted with Branchlines conversion wheels is probably by far the quickest route to a working P4 passenger train. None are really even remotely appropriate for my little tramway though. Not even the Heljan railbuses fit the bill - apart from anything else, they are all slightly too modern. There is nothing much in the way of kits either. Worsley Works do scratch-aid kits for Colonel Stephens-style railcars, but (not complaining) they really do require a lot of work by the modeller to turn them into accurate, working models. Despite this, I acquired a Worsley Works double K&ESR Ford railcar kit anyway. I found one going cheap on Ebay. I am caught between the devil and the deep blue sea here. Colonel Stephens’ designs only ran on his railways. Putting one exactly the same on my tramway would be wrong, or at least very unlikely. Equally, making a unique “Neversay” railbus would be totally inaccurate as the tramway is totally fictitious. This option does offer more scope for my imagination though, which sounds like fun! Basing an imaginary one on real-life prototypes and features does hopefully make even fictitious stock seem just a little more believable. There are plenty of different adaptations of Ford chassis on the Internet. One that particularly caught my eye as ripe for a Worsley Ford conversion was one that ran on the Dublin & Blessington. The photo is copyrighted, so I have put a link to the photo. This had a body very similar to the Worsley kit, but with a rear entrance (one side only). I found a photo in a book, but don’t want to infringe copyright by reproducing it here. Basing my railbuses very roughly on this design has definite appeal. The plan is to model two of these permanently coupled back to back, using parts from the Worsley kits, as appropriate. Powering these small railcars in 4mm scale seems to be a perennial problem. The usual way is to power just one axle – simple, but not necessarily ideal. Getting enough weight on the axle to push 2 railcars is an issue. Powering one railcar using both axles must be possible, but a gear wheel on the front axle would be very conspicuous. A motor within the body of the railcar, with its large window area, is difficult to conceal. A third option would be to power an intermediate powered trailer, but I don’t really want one of those. Another alternative is to power the rear axle of both cars. One motor in each car is one way, but not ideal. My wacky idea, which really appeals in this instance, is to make a kind of powered bogie arrangement out of the two rear axles. This ought to improve traction, as both axles would be connected through gears. My sharpest curve is only 4ft radius, so the wheels will not need to move very far laterally, if at all. I can probably get away with it in this instance because the steps at the rear of the railcar bodies will largely hide the bogie. Some kind of simple corridor connection between the two railcars might also help, if necessary. I bought a High Level Lowrider bogie kit a while back. This just happens to be more or less exactly the wheelbase I need. If I reduce it to a minimal profile and it should be fairly inconspicuous (I hope!). To add to the subterfuge, I may try somehow to connect it to a smaller motor than the Mashima 1420 that comes with the kit. OK, it’s a crazy idea, but I am just a little bit desperate! It will be reassuring to think that, however I might try, I doubt I could ever hide the motor and transmission completely in such an open body. A perennial problem for me is going to be supplies of small diameter P4 wheels. Gibson and Ultrascale only go down to around 11mm diameter, which is too large for many project ideas. Ultrascale do the ‘Model Rail’ Sentinel conversion wheels at 10mm diameter with 1.5mm stub axles, which probably have potential for other things. For 6 and 7mm diameter wheels, then Farish N gauge wheels seem a reasonable compromise. I have convinced myself that I can adapt these relatively easily to run on P4 track. Unfortunately, quite a lot of railcars I have looked at require 8 or 9mm wheels. I managed to find a small supply of Romford OO gauge 7 and 9mm wheels, which may be adaptable, but that still leaves the 8mm diameter slot vacant. In this case, I am playing it safe. I am going to try Ultrascale 2ft 9in (11mm) disc wheels, which just about do for this one. Now that the Nucast Sentinel railcar kit is back on the market, I do have at least one other kit option to go for. More of that in due course, as straightforward construction of the kit (as designed) wouldn’t really be my style. A bus conversion, Irish style, would also be an interesting idea, but relies on finding a good body for a believable rail conversion. Otherwise, it is pretty much scratch building from bare metal or plastic, which is hardly a quick win. I have found a few really interesting vehicles I would like to model, but they will probably have to wait until the layout has progressed a long way and I have far more time on my hands for stock building. If there is anything I have missed, or other ideas that you can come up with, please do comment. There is some interesting material on micro motors on the CLAG website http://www.clag.org.uk. I also seem to remember someone writing about putting a motor in a very small maintenance trolley (something starting with a W ?) if that is of any help. Sounds like an interesting project. I would chat to Robin Gay, who is the builder and owner of Rolvenden. He has managed the same railcars. Not sure when his layout is next out, but it is a regular on the circuit so will be out soon! Have a chat to Branchlines. They do 8mm wheels from memory. As they all use 2mm axles, you might need to look at open spoked wheels and fill them with Milliput. Branchlines also a do very nice little gear box meant for trams. It's a 17:1 worm with a 2:1 second stage. I have one in my scratchbuilt small Drewry WC&PR railcar. Having looked more closely at my Lo-rider kit, there would be little left but the gear trains by the time I had finished trimming it down. This would be a bit of a waste. I may therefore buy in some components and scratchbuild a minimalist power 'bogie' instead. Being a member of the 2mm Scale Association means that I have access to their range of gears etc. I wasn't aware that Branchlines can supply small diameter wheels. I will definitely follow that lead up with great enthusiasm. Manufacturers of railcars like Drewry, Wickham and Walker were very keen on building vehicles with very tiny wheels. It would really open up the potential range of railbuses and railcars that could be modelled and give my layout the kind of unique character I am looking for. Seriously, the kit for the Kent & East Sussex Railcars is turning out to be a really interesting challenge. The most vital part and the greatest unknown is probably the motorised part of the chassis. To get some idea of scale though, I decided to assemble the body sides of one of the railcars first. I decided to keep the sharply curved tumblehome of the K&ESR design as it adds a bit of character to the design. With 2 such railcars back to back, there needs to be a 'corridor connection' between the 2 cars. I began by filling in the half-etched side door outlines in the kit with solder, as these are not required. I shortened one side to just 4 windows long, apart from a narrow strip at the top which will go over the entrance. I cut the middle window out of the rear end panel of the body to form two part-ends. After bending the tumblehome, I then carefully soldered the bits together to form the body as you see it below. The far corner is the back of the vehicle, with the shortened side on the right. This has a recess for the steps and entrance to the vehicle. I had to be very careful with the solder as the window pillars are very narrow. I had to make sure there was enough room for the glazing. Therefore, I soldered along the outside of the joints rather than the inside and cleaned the excess solder up afterwards. Here is the view from the opposite corner. The sides are actually reversed, compared with the KE&SR design, so that the rear entrance was wide enough to meet my satisfaction. I will finish the back end of the bodywork off with scraps of brass sheet and brass angle in due course - along with the second body. I think I have done enough for now to be able to work out how the body and chassis might fit together. Next, I plan to have a go at the powered part of the chassis, which needs to be as narrow and inconspicuous as possible. This won't affect my current project, for which I already have suitable wheels. Many thanks for your confidence, Rob. I guess the ultimate answer is to turn my own wheels. I don't think my little Unimat lathe is up to it though. I may have to invest in something more robust. Would come in handy for other things too. What about 009, N or 2FS wheels? Thanks for the ideas, Jon. The N scale wheels readily available are 7mm or smaller and can be useful as the profile (Farish wheels, at least) is not too dissimilar to P4. At worst, a quick brush with files in a lathe or electric drill would probably suffice. I have experimented with some Farish 7mm wheels on longer axles and they do seem to run OK on P4 track - though they may be closer to a fine EM profile than true P4. 2FS wheels are too fine for our use. Flange depth is OK. but the flanges and tyre treads are very narrow. We would have to add metal to them before they would work reliably. I don't think there is anything specifically for OO9, as they tend to use N gauge wheels and chassis. Mentioning OO9 though made me think about anything that might be available for HOe. I did find these wheels with a quick search, which may indeed be useful - and there may well be others. Many thanks for the suggestion! Those might be perfect for a Drewry railcar I have in mind. Thinking again about this overnight, the hassle of re-profiling wheels with a poor profile in a lathe can be more trouble than it is worth, especially if the wheels are plated, or not fixed very securely on their axles. Even taking them off axles to put on new, longer ones can result in wobbly wheels. For wheels that are reasonably good already, It is relatively easy to thin down the backs of flanges and reduce the width of tyres quickly in a lathe, provided you don't touch the bits that touch the rails. That way you maintain the concentricity of the wheels without having lots of awkward and time consuming setting up on the lathe. I once did a large batch of N gauge wheels to 2FS that way. Following suggestions from a fellow modeller, I will now be trying a High Level Pacemaker in the Ford railbus before I consider the motor bogie idea any further. Assuming the Pacemaker works well enough, it should be a lot quicker than scratch-building a motorised chassis. Regarding 8mm diameter wheels, I may have found a good mainland-European source on Ebay. I have ordered some for evaluation. If they can easily be adapted to P4 standards, I can think about going ahead with plans for a second railcar chassis - for a Drewry. 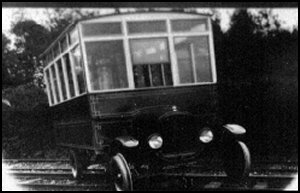 The one in the photo started out on the Dublin & Blessington Tramway and was later regauged for service on the County Donegal. The body sides of the railcar are very similar to the lower deck of a Kiel Kraft Birmingham tram kit I have in my gloat box. I have a couple of ideas for the chassis - including a re-wheeled Halling motor bogie for the centre part (also in my gloat box - it is a very big box!). Similar chassis were supplied to India and Tasmania, though fitted with very different bodywork. More on that in due course. I will keep this idea secret for a while, as it might arouse a few suspicions as to where my modelling ambitions are taking me ...... suffice to say that several running chassis with very different characteristics would be really good for giving my unique trackwork a thorough test, as well as good for honing my modelling skills. I have been doing a lot more research on the Dublin & Blessington Drewry - but as often happens, the deeper you delve, the more you realise you don't know - and in this case neither does anyone else as far as I can find out. The main problem is the interior - and in particular where was the engine sited; what was the seating layout. The remains exist at Cultra converted to an unpowered trailer, but as I have found out, it is much changed. Inevitably, the available drawings contain serious errors, too! More research is required. In the end, Rule 1 may have to be applied! In the meantime, the High Level Pacemaker kits arrived. I bought one with gears and one without. I assembled one more or less as is and knocked together a very rough chassis with OO wheels to see what the problems would be powering just one axle in the Ford 2-car set. Unfortunately, I quickly decided it was going to be difficult to get enough weight on the driving axle to make the railcar pair really reliable. The big problem is that the open entrances at the rear of the version I am modelling would not allow much, if any hidden weight at the rear of the car. Pragmatic as ever, I have decided to use the Pacemaker in the second railcar body, which I will build more or less the way it was intended. This will give me much more room at the rear to hide weights. I will build this as a solitary railcar rather than one of a pair. That way, haulage issues should not be a problem. I will be trimming the Pacemaker quite a bit this time too, now I know what they look like assembled. The body I have already chopped around will still become part of a pair. I just need to buy another Worsley Works kit. I think I will resurrect the power bogie idea I started this topic off with, but to my own slender, minimalist design rather than trying to adapt a High Level bogie. That should reduce the problems quite a bit. I will make it a low priority though. I will have to order more Ultrascale wheels for a start and wait for their arrival. I can experiment with the power bogie idea in the meantime. Building the single railcar first will give me experience of turning these kits into a working model. Some of the work will be common to all, like the front axle assembly and power pickup arrangements. Hopefully, more news of that soon! Just so with the Ford railbuses. After a brief, unhappy diversion, when I decided to listen to reason and try a more conventional approach, I am more or less back to this. Incidentally, an original Model TT chassis is currently on sale on Ebay HERE which contains some great photos. So, I will try and make a go of this idea over the next few days, whilst I slowly install the locking tubes for my turntable one by one and wait for the glue to set. I am not sure yet if this will just be a 3D concept experiment, a prototype, or the final thing. Only time will tell. Catching up with this thread - I thought it might be helpful for you to see a similar beast that I have constructed in p87, so in terms of mass and shape it's not too dissimilar from what you are trying to achieve. The prototype is one of the railcars produced by the Triangel company in Odense, Denmark, for one of the Danish private railways. It dates from the 1920s. Originally petrol engine, but later converted to diesel, it has a simple drive from a front mounted engine, through a gearbox to the rear axle. That's exactly the layout I chose for the model. The motor is a Mashima 1016, with flywheel, and the gearbox is from High Level. Wheels are Gibson 10.5mm disc on 2mm axles. All axles are sprung using my own w-irons (similar in design to Bill Bedford's). Bodywork is from my own etchings. The model is a sweet little runner and a regular performer on my 'Obbekaer' layout pulling 2 or 3 wagons on the pick-up goods. All goes to show that if you keep things simple and fairly well engineered, the more elaborate solutions are not needed! Thanks Geraint. That is a beautiful model. The problem I have with my Ford chassis is adhesion. By moving the entrance to the rear, like on the Dublin & Blessington railcar, I have nowhere much to hide weight behind the rear axle. The motor would fill much of the space ahead of the rear axle, so not much room for weight there either. Therefore when I did a crude mock up in OO, the chassis would haul itself, but not much else, reliably. I am hoping that the 'motor bogie' idea will overcome that by providing 2 driving axles and better weight distribution. If all else fails I can always revert to a front door design, but I really want something that doesn't look exactly like a Colonel Stephens clone. This is just a bit of fun, really. Having thought of the idea, I really am curious to see how well it works out. In the words of a well known TV show, "I've started, so I'll finish". White metal passengers could add a bit of ballast. dal-t wrote: White metal passengers could add a bit of ballast. Agreed! Like this do you mean? Seriously, I shall be trying every trick in the book. Another point in trying the 'invisible bogie' method is to experiment with ideas that might be valid for other projects. For example, I have a few road vehicles pencilled in for conversion to rail, including a Land Rover, two Chevrolet trucks back to back and an automobile for the General Manager. The Ford railbus project will allow me to experiment with very small gearboxes and other novelties that might be useful later on. This project should be fun and I should learn a lot, one way or another. Even if it doesn't work, I will always value the experience gained. Armchair Modeller wrote: This project should be fun and I should learn a lot, one way or another. Even if it doesn't work, I will always value the experience gained. Despite Geraint's model being in HO scale (I assume?) the 4mm scale Ford railbus is noticeably smaller. The Ford also has inside bearings, which means I cannot (unfortunately) use Geraint's neat suspension idea. Never mind! Armchair Modeller wrote: The Ford also has inside bearings, which means I cannot (unfortunately) use Geraint's neat suspension idea. Never mind! Thanks, very kind Rob - but not only do I have my own ideas - the rear axles are already made (sort of). I am using Ultrascale wheels and a similar system to yours with tubes, but these axles need gears too, so had to be two tubes, one either side of the gear wheel. My front axles will be just one tube, as these axles are not driven. Here is what the real thing looks like on a road vehicle, rear first, then front. Looking at photos, there were various ways of adapting for rail use, though the Model TT was more or less perfect for standard gauge rail conversion. Some conversions involved little more than simply replacing the road wheels with flanged wheels. On others, the axles and sometimes the suspension seem to have been beefed up. Hopefully, I will have photos of the final version of my model axles by tomorrow evening. Armchair Modeller wrote: Hopefully, I will have photos of the final version of my model axles by tomorrow evening. Famous last words! Not long after writing this, I decided to change from Ultrascale to Exactoscale wheels for appearance sake. The new ones are spoked, rather than plain discs, which will make for a slightly more interesting model. I have also ordered some new reduction gears for the mechanism. More progress when these have arrived! Mind you, I see this topic is mentioned on page 43 of the latest Scalefour News. Last time I got a mention from Mr Litchfield, it was about the layout in general (Neversay version one). This turned out to be the kiss of death for that particular project. Will the curse strike again, I wonder?